But these days, McCabe, 23, is a top-pair defender, skating in every situation for a team whose blue line has been ravaged by injuries in recent weeks. So the Wisconsin native’s versatility has earned him another moniker. McCabe has quietly morphed into the Sabres’ unsung hero in the last month, averaging 23 minutes, 47 seconds of ice time in the last 14 games. Sabres coach Dan Bylsma recently promoted McCabe to the No. 1 pair beside Rasmus Ristolainen, a spot Josh Gorges had occupied for more than a year. It’s not crazy to think McCabe and Ristolainen, 22, could be the team’s top tandem for years to come. McCabe played a career-high 28 minutes, 52 seconds in Monday’s 3-2 overtime loss in Washington, a game he spent defending superstar Alex Ovechkin. A night later, with his minutes scaled back a bit, McCabe faced Edmonton Oilers phenom Connor McDavid throughout the Sabres’ 4-3 overtime win. McCabe has grown rapidly in the last 14 months. He enjoyed a stellar training camp in 2015, forcing the Sabres to keep him. 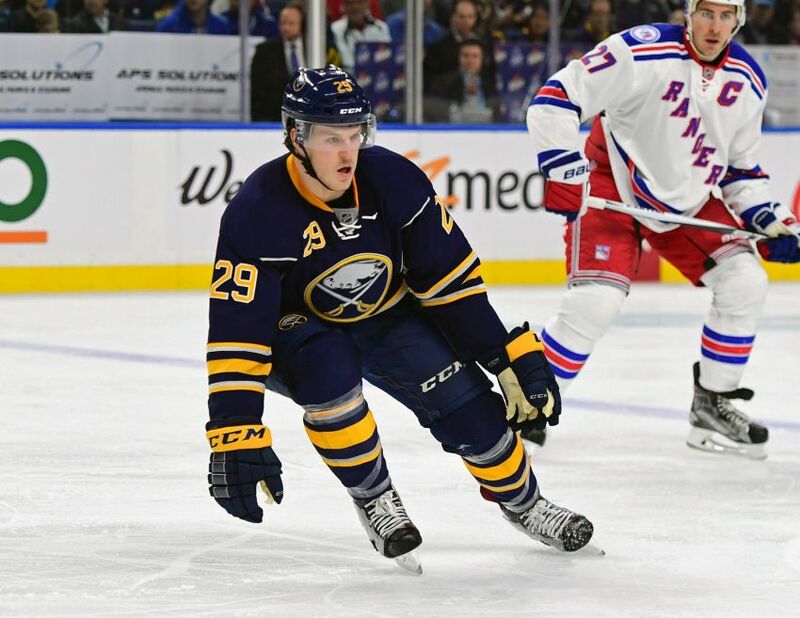 A year ago at this time, McCabe said, the Sabres finally told him to find a place to live because he wouldn’t be returning to the AHL, where he spent the majority of 2014-15, his first full pro season. McCabe began this campaign with some new comfort and more confidence. “It’s stability and know that I belong here and know that I can be a top-four defenseman in the NHL and with this team,” McCabe said. Early last season, McCabe said, he was worried about making the Sabres and pressing. “This year, I know the player I am and know the way I can play, just the comfort level with the coaching staff and the players and my role with the team, I think I can be a leader – and we have a lot of good leaders in this room – just by the way I play,” he said. Right away this season, Bylsma noticed a change in McCabe. That’s why McCabe was upset following Tuesday’s win. Sure, the Sabres roared back late. But they also blew a commanding 2-0 lead, chasing the Oilers for the final 30 minutes of regulation. “He’s a guy who’s taken a lot of responsibility for that and taking it on his shoulders, and that’s something that’s coming in his game, developing in his game and we need more of in his game,” Bylsma said.